When Josh Daskin traveled to Mozambique’s Gorongosa National Park in 2012, its iconic large animals were returning from the brink of extinction. Gorongosa, among Africa’s most spectacular wildlife preserves until the 1970s, had been devastated by an anti-colonial war of liberation followed by a ghastly 15-year civil war — a one-two punch that exterminated more than 90 percent of the park’s wildlife. The park’s violent past intrigued Daskin, then a first-year Princeton graduate student in ecology and evolutionary biology. As he explored the savannas and grasslands of Gorongosa with his advisor, Robert Pringle, an assistant professor of ecology and evolutionary biology, they discussed whether similar wildlife declines might have occurred across Africa during the many conflicts of the 20th century. If so, they wondered how severe the impacts had been, and if animals generally retain the capacity to rebound like those in Gorongosa had, or if war was a human pressure that most animals just couldn’t withstand. After years of examining conflict in Africa’s protected areas, Daskin and Pringle reported in the Jan. 10 issue of the journal Nature that war has been a consistent factor in the decades-long decline of large mammals in Africa. Populations that were stable in peaceful areas needed only a slight increase in conflict frequency to begin a downward spiral. But, the researchers report, while wildlife populations declined in conflict areas, they rarely collapsed to the point where recovery was impossible. The researchers found that more than 70 percent of Africa’s protected areas were touched by war between 1946 and 2010, an era during which the overthrow of European colonial rule was followed in many countries by violent post-colonial power struggles. Elephants, hippos, giraffes and other large mammals perished as combatants and hungry citizens hunted animals for meat and for marketable commodities such as ivory. Nonetheless, said Daskin, who completed the study as part of his doctoral dissertation at Princeton, the findings show that even those protected areas most severely affected by conflict remain promising candidates for conservation and rehabilitation efforts. The study was supported by the National Science Foundation and the Princeton Environmental Institute (PEI). The study was needed to establish a general scientific expectation about how conflict typically affects wildlife populations, said Pringle, who is associated faculty in PEI. “It wasn’t obvious to us in advance that conflict would have negative effects on wildlife populations,” Pringle said. “Different studies of different places at different times have found both positive and negative effects of conflict on biodiversity, but the overall net effect had never been measured.” For instance, previous research has shown that animal populations have increased in contested regions such as the Korean Demilitarized Zone (DMZ) and rural Zimbabwe during that country’s Bush War of 1964–1979. Daskin and Pringle, however, found that with few exceptions, frequent conflict resulted in a downward trend among large-animal populations. No other factor they evaluated exhibited the same consistent effect. There was no statistically detectable effect on wildlife trajectories from mining, urban development, corruption, drought, or even the intensity of the conflict as measured by the number of human battle fatalities. Hugh Possingham, the chief scientist at the Nature Conservancy, concurred that social structures ultimately determine the fate of animals and protected areas. Possingham had no role in the research but is familiar with it and has published on related topics. “The most surprising finding is the strength of the relationship between the presence of conflict and declines in large mammals,” Possingham said. “One might have imagined that the magnitude or scale of conflict would be the driver, but the mere presence of conflict seems to be a strong predictor in its own right. 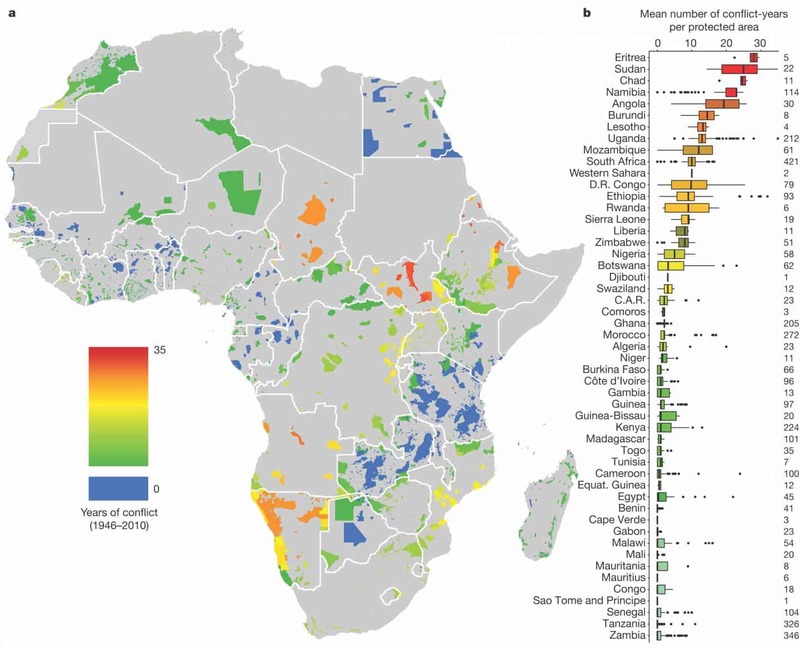 Daskin and Pringle found that 71 percent of Africa’s protected areas experienced one or more conflicts from 1946 to 2010. For a quarter of these areas, wars occurred for an average of nine or more years. Several large nations experienced an average of 20 or more years of conflict per protected area, including Chad, Namibia and Sudan (before it split into Sudan and South Sudan in 2011). To conduct the analysis, Daskin drew from nearly 500 sources to find estimates of a specific animal species’ abundance from at least two years between 1946 and 2010. He compared those estimates in order to calculate the change in population density during a given time interval. Daskin then used a series of databases to identify how many conflicts overlapped with each of Africa’s protected areas during the study interval. In the end, the researchers examined the trends of 253 animal populations representing 36 species, ranging from antelopes to elephants, in 126 protected areas across 19 countries. Gorongosa, the park in Mozambique that originally inspired the study, exemplifies the thrust of the findings, Daskin and Pringle said. From 1977 to 1992, government soldiers, anti-government militias, and refugees alternately fought in or fled through the park. For years after the war, displaced and dispossessed residents hunted wildlife. By the early 2000s, the elephant population had crashed by more than 75 percent, while successive aerial counts found that buffalo, hippo, wildebeest and zebra numbers were hovering in the single or double digits. Yet none of these animal populations disappeared completely. Since 2004, wildlife in Gorongosa have rebounded to 80 percent of their total pre-war abundance. Park staff, the Mozambican government and the nonprofit Gorongosa Restoration Project have worked with neighboring communities to nurture the remnant animal populations by suppressing illegal hunting and creating educational and employment opportunities for villagers within the park. When people have a personal and economic stake in a thriving ecosystem, they embrace protective behaviors such as preventing poaching and monitoring wildlife, Possingham said. “This publication confirms the philosophy behind that approach,” he said. The paper, “Warfare and wildlife declines in Africa’s protected areas,” was published online by Nature on Jan. 10. This work was supported by the National Science Foundation (grant nos. DEB-1501306, DEB-1355122 and DEB-1457697) and the Princeton Environmental Institute’s Grand Challenges program (project title: “Ecosystem Spatial Pattern and Development Opportunities in African Rangelands”).